Today I released a new version of wxBanker, which is a lightweight personal finance manager. It is basically a digital checkbook register for multiple accounts; think of GnuCash but easier and more lightweight. It is written in Python/wxPython and runs on Linux, OSX, and Windows. Check out my previous post on wxBanker for a slightly more in depth functionality overview and screen shots. The main focus of this new version was localization. It now ships with translations for 8 languages (4 of them basically complete, thanks translators! ), and also supports displaying the amounts in currencies other than USD including EUR and GBP. It also sports a few of the typical bug fixes / usability improvements you would expect in a new release. 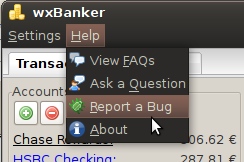 Another feature new to 0.4 is a setup.py, which allows Linux users to install it easily by running “sudo python setup.py install” in the folder, and wxBanker will install itself including a shortcut in Applications -> Office in Gnome, and store your data in ~/.wxbanker. If you are upgrading from a previous release, I recommend moving your bank.db file to ~/.wxbanker/bank.db for the easiest transition, which will also future-proof you from needing to shuffle it around in the future! If you have been looking to start taking control of your finances, give wxBanker a try: https://launchpad.net/wxbanker/trunk/0.4 (or ‘bzr co lp:wxbanker -r 86’ for the seasoned). If you find problems or have ideas, please let me know via launchpad bugs/blueprints, blog comments, or email; if you know another language, help translate by following the Translations link on Launchpad! And remember, when you use wxBanker to count your pennies, the dollars will follow! Hi again David! I tried to design wxBanker in such a way that a double-entry system is possible but not necessary. You can use it as such by creating all the appropriate accounts, and then each transaction would be a transfer between the appropriate accounts. However the total wouldn’t quite work out in an ideal way I don’t think, so some work might need to be done there. Currently I use a hybrid sort of accounting system where I have Accounts Receivable and Payable and make transfers to and from them as appropriate, with other basic purchases being single entry. As far as patches go, just visit https://bugs.launchpad.net/wxbanker/+filebug and make a bug for the specific issue, attaching your patch to it. Then I’ll see it and review it and such. I look forward to seeing what you have! Will definitely get my Mrs. on to it though for our home finances. What’s the best way of submitting patches? David, the scope of wxBanker is personal and small business finance, so it may work for you, although it doesn’t currently have any built in reporting (however the store is a sqlite3 db with the structure documented in model_sqlite.py so custom stuff should be fairly straightforward if you are into that). I’d love to implement reporting features, but don’t know exactly what that entails. If you or anyone else wants to outline the basic details in a blueprint at https://blueprints.launchpad.net/wxbanker, I’ll be happy to implement it! Mean-Machine, let me know what you think and thanks for the translation! I’m giving it a go. Never got to like GNUCash. Also translating into polish.